Michael Bryan, founder of Bryan's Funeral Home Ltd and director for 23 years. Michael was involved in the funeral services industry for almost 48 years. He first started at Lyndhurst Funeral home in 1965 which at that time was under the stewardship of the late Colin Parkinson and George Gill. After serving 14 years with that company he went on to establish Bryan's Funeral service at his home in Belleville, St. Michael where he ran a successful business for another 8 years incorporating a fleet of taxis and a strong affiliation with many other funeral directors which is still appreciated to this day. After another short stint with Lyndhurst Funeral Home between the years 1987-1990, BRYANS FUNERAL HOME LTD was established in Belmont Road, St. Michael now at its present site. 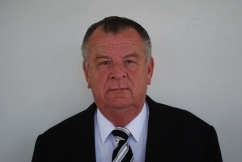 Michael Bryan was a dedicated member to the funeral services in Barbados. Michael passed away on November 21st 2013 leaving his legacy with his wife Deirdre, children Neil and Gail and loyal staff. Neil Bryan, managing director/funeral director, son of the late Michael Bryan has been with the company since 1992 after returning from University in Florida U.S.A with a Bachelor's degree in Business Administration. Neil's role in the company places him at the forefront of the funeral services industry from the first call, through the entire funeral process making planning a funeral service problem free and dignified. Neil also takes a special interest in the area of CREMATION and can take you through every step of the cremation decision with careful planning. Neil is a husband and father of two. Gail Peirce, managing director/funeral director, daughter of the late Michael Bryan has been with Bryan's Funeral Home from its inception in October 1990. Gail's role in the company is the daily administrative duties of running the funeral home and taxi service from accounts to human resources. In recent years Gail has entered the role of funeral director where she assists families with the funeral arrangements and attends funerals with a keen eye for detail and service. Gail is a wife and mother of two.